This is Hazel, my miniature peach rose right after I brought her home, the last rose at the store. Right after Christmas, I picked up this peach-colored miniature rose for $2.49 at a local grocery store floral section. It was the last one remaining from a group of miniature roses that had included red and white "peppermint" ones; solid red ones, a few white ones and a couple of the peach-colored ones. Miniature roses like this are actually tiny repeat-blooming shrub roses, hardier than hybrid tea roses and the easiest roses for me to grow. I have a number of them scattered throughout my USDA Hardiness zone 5b one-acre hillside garden planted among other perennials. Last year, I also started a miniature rose border with several different-colored tiny shrubs. Purchased on sale, of course, part of the fun is the plant treasure hunting! When I saw this lone plant on sale, I couldn't pass it up. We were heading into record cold weather and having something in bloom, even something tiny, cheers me up any time of the year but in winter. Well, it's a must. You should see my living and dining room, it's a veritable jungle. 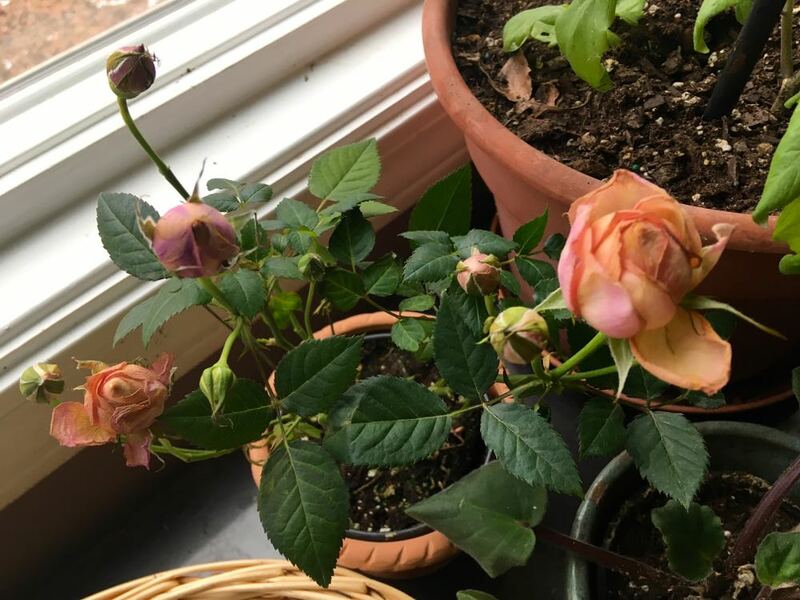 Even though I have heard some people say they can't grow miniature roses inside over winter, I have had very good luck pulling miniature roses through the cold months. The trick is to give the plant cut up banana peels and crushed egg shells in the bottom of the new, larger pot in new potting soil, and to not overwater. So here's Hazel about a month after I brought her home. I finally cut off the peach rose bud before I took this picture so she can focus her energy in growing new leaves. This is Hazel about a month later, sprouting new growth next to her friend, Miriam, a tomato plant. I check her every morning for bugs, just in case something has found her tender leaves to munch on. Although I try to not have plant bugs - the white mealy bugs are the worst, second only to scale - I keep a close eye to jump on anything that may be getting a start. If she were growing outside, I would add onion sets around her to keep bugs away and add a basil or two for good measure. Inside my house, she's going to have to depend on my good eyesight and soapy water if she gets unwanted visitors.